All photos taken with the flash. This is easy to use, easy to apply and quick drying (2-3 minutes a coat). 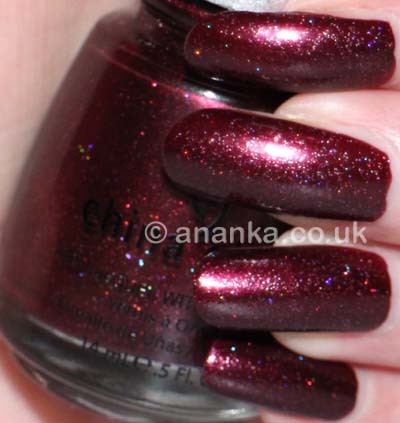 It's a really pretty dark colour with lovely holo sparkles. These little sparkles are tiny and quite hard to see! The polish isn't smooth because of these little sparkles - you can just about make that out in the photos. Noticed slight tip wear on a few nails but lasted well otherwise. Oh wow, that's a stunner! Why have I never heard of it? Not too bad, I like that little spark in the polish but I would get annoyed about the smoothness issue. However that maybe is solved with top coat? That is gorgeous, I think I need to search for that one!! Basically I love this polish, but I've never been wearing it because of the finish. Looks as if you got measels on your nails :o(. Lovely! I know, when such a polish with microglitter is dry, the surface is slightly rough. What a lovely deep colour! oh my! I love this dark red shades! and the holo effect is just what I like, not too over the top but still visible. 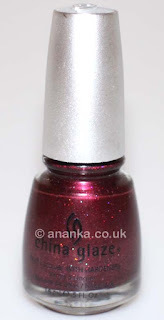 It really is a great colour and the holo dust only makes it more wanted by me! this is such a classic!! I gotta find mine and wear it again!! !